This past Saturday, September 16th was National “Tell a Police Officer Thank you” Day. Tell a Police Officer Thank you day encourages community members to take time to thank, support and encourage their local Police Officers. These Officers put their lives on the line everyday to protect the families in their cities and towns. Read a story from one of L-Tron’s own, Sergeant Chuck Grasso, by clicking here. 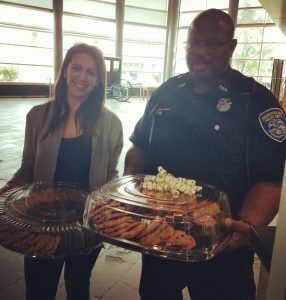 To thank our local officers, L-Tron dropped off cookies for the Rochester Police Department to share. The officers were very thankful for the sweet treats! L-Tron has a long history of supporting Law Enforcement. In the past, we have participated in “Cookies for a Cop” and have shared our own personal stories about how Officers have made a difference in our individual lives. This year, we teamed up with Usbourne books and the Jack Foundation to run a “Cuddle Bear Drive” – providing Officers with teddy bears and books to give to children they might encounter on their calls. Bring treats down to the station. Visit a memorial and pay your respects to those who have given their lives. Thank a Police Officer in your neighborhood. Thank a Police Officer by sending notes or cards to the station. Share positive stories about how a Police Officer has helped you. Pay it forward – pay for a Police Officer’s lunch or morning coffee in your travels. Has a Rochester Police Officer helped you? Commend a Rochester Police Officer that has gone above and beyond. Visit the City of Rochester website and shoot a quick thank you to an Officer who has helped you or made a difference in your life. This is an easy way to honor a Law Enforcement Professional for National Thank a Police Officer Day! Questions? Interested in learning more about National Thank a Police Officer Day?